DigiTech by HARMAN and UK distributor Sound Technology Ltd are pleased to announce immediate availability of the new DigiTech Nautila Chorus/Flanger pedal. 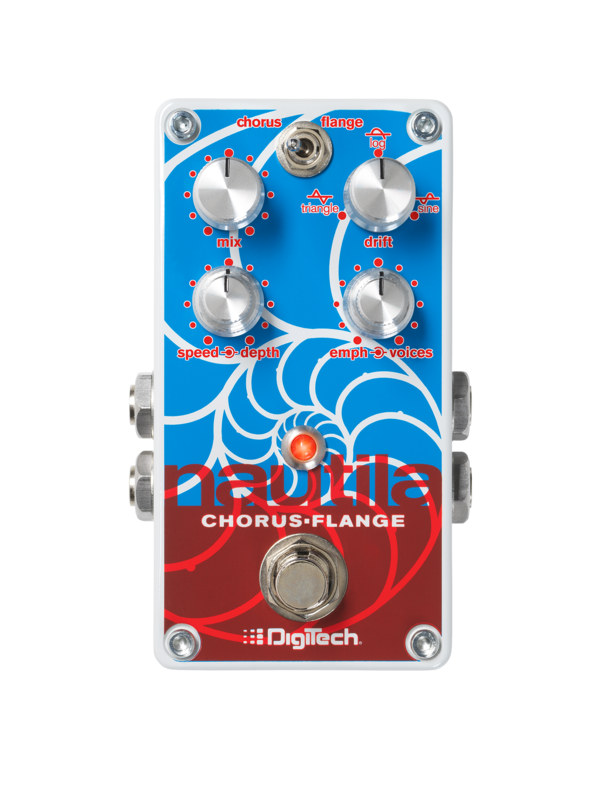 Sing a song of stormy oceans and float upon the calming seas with the new DigiTech Nautila Chorus/Flanger. Create never before heard tidal swirls or soothing rhythmic waves with the Voice and Drift controls. These controls allow you to add up to eight chorus voices or four flanger voices, and then blend and morph these waveforms at will. Increase the modulation speed in real-time by holding down the momentary footswitch and then release to continue on your voyage through the currents. Separate Speed, Depth, Emphasis, Voices, and Mix controls shape your waves into clean curls or soupy foam. True Bypass, stereo inputs and outputs, silent switching, and rugged construction, make the Nautila as practical as it is creative. The Nautila focuses on quick, easy, performance control to allow guitarists and bassists to customise their modulation with minimal effort. Additionally the intuitive nature of the control functions and layout are designed to inspire creativity. High-voltage rails allow the Nautila to be used with high gain pedals and in amp FX loops with no loss of fidelity. Since the Nautila works equally well on guitar or bass, this single pedal takes the place of, and also surpasses, several chorus and flanger pedals that were previously offered by DigiTech in the Hardwire and X-Series pedal lines. The DigiTech Nautila is available now priced at £129 RRP ex VAT.